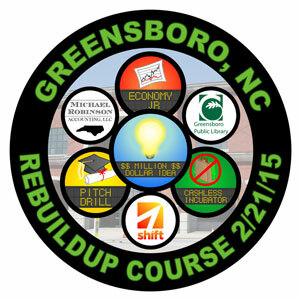 QUALIFIER EVENT – Today’s ReBuildUp Course event at Central Library in Downtown Greensboro will take place from 1:00-5:30pm. This event is sponsored by Michael Robinson Accounting, LLC with Shift, the Nussbaum Center’s Entrepreneur Group, helping coordinate volunteers. The purpose of this event is to have players participate in four entrepreneur mini-games to help select up to 8 finalists for the PitchPocalypse business plan pitching contest held next Thursday, February 26th 6-8pm also at Central Library. – FREE business filing assistance from Elon University’s Business Clinic (does not include local and state filing fees).